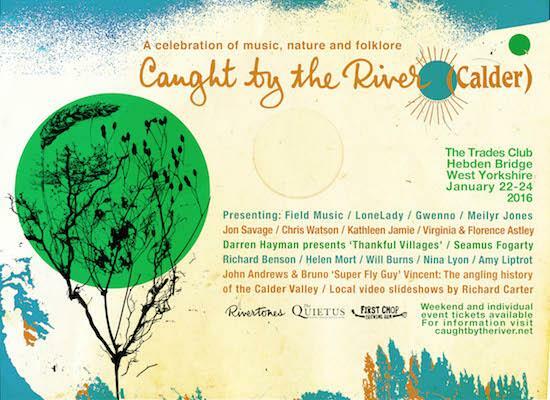 In January next year, Caught by the River will head up north to Hebden Bridge for their first mid-winter weekend event, Caught by the River Calder. It’s all being hosted in association with ourselves at tQ and First Chop Brewind Arm and will involve a weekend of talks, music and of course drinking in the town’s Trades Club. Taking part in the weekender will be Field Music, Meilyr Jones, Seamus Fogarty and Caught by the River DJs who all play on the Friday evening. The next day will involve events from Darren Hayman, Jon Savage (who will talk 1966 and that year’s impact on culture) and Will Burns, Helen Mort & Richard Benson who will talk place, poetry, prose and politics. On the Saturday evening there will be music from Lonelady (who recently featured on our Jovian Bow Shock Prize shortlist), Gwenno, Chris Watson and Heavenly Jukebox DJs. Rounding off proceedings on Sunday will be entertainment from sound recordist Chris Watson, Virginia & Florence Astley, Amy Liptrot (author of The Outrun in conversation with our own Luke Turner, Nina Lyon and poet Kathleen Jamie in conversation with Faber Young Poet Will Burns. There is a limited number of weekend tickets available at £50 guaranteeing entry to all events at the Trades Club or tickets are also available for individual events. Friday night tickets are here, Saturday daytime tickets here, Saturday night tickets here and Sunday daytime tickets here. You can find out more information here. Caught by the River Calder runs from January 22-24.